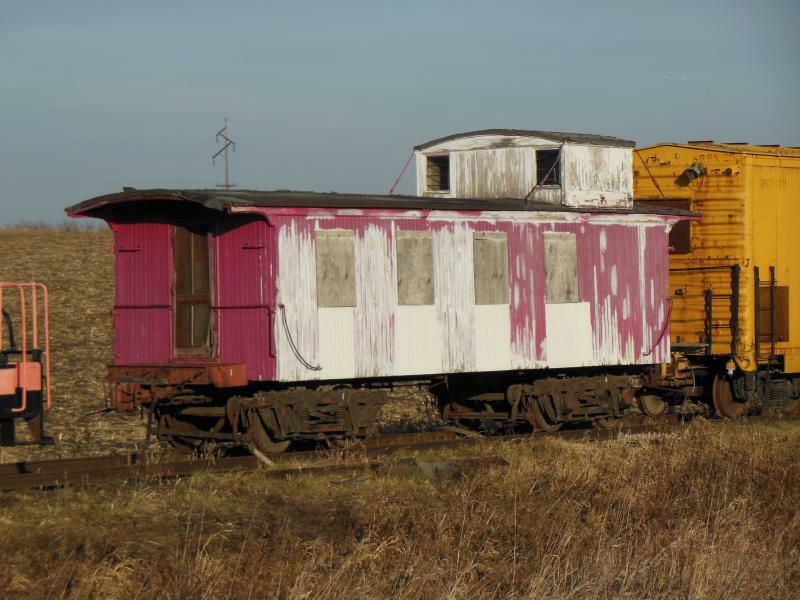 As part of GSRM's mission statement, it has accumulated a small collection of rolling stock and locomotives for restoration, display and operation. Most of GSRM's collection is awaiting funding for restoration as well as a shop building on-site to carry-out the restoration work. If you'd like to make a contribution to help fund these and other projects, please check out our "How can I help" page. Manitoba is likely the most significant find in GSRM's collection. 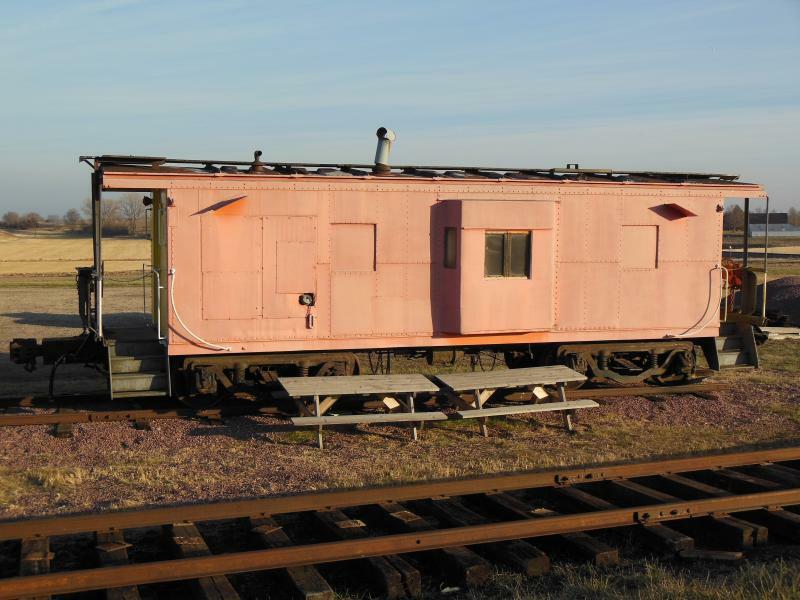 The open platform office car was built in May 1880 by Pullman for the St Paul, Minneapolis & Manitoba Railway as its office car Manitoba. Manitoba was used extensively by James J Hill in the construction of the StPM&M and later the Great Northern Railway. Manitoba lost its name sometime in the mid 1890s, becoming GN business car A2. It was retired around 1935 by which time it had been renumbered GN A16. 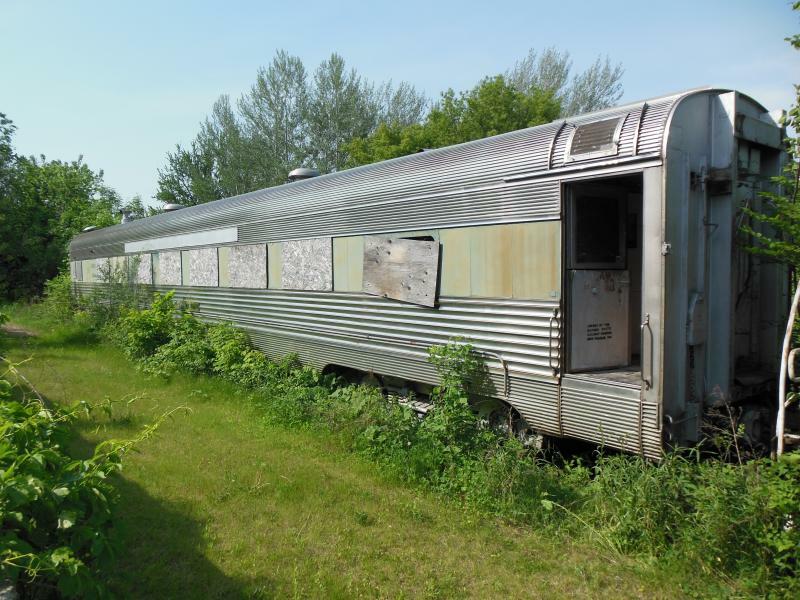 Walter James, a local business man and owner of the Nankin restaurant franchise bought Manitoba's car body for use as a guest house at his Howard Lake, MN farm. By 1998, Manitoba sat, largely forgotten except by the home owners whose home Manitoba was now an integral part of. By a chance meeting with the homeowner, GSRM was made aware the car was for sale and the home was slated for demolition as part of a state highway realignment. GSRM purchased the car and moved it to New Prague. Netiher GSRM nor the homeowner knew Manitoba's identity at the time. Manitoba is currently awaiting restoration. Chicago, Burlington & Quincy 4711 Silver Crest and 4713 Silver Forest are stainless steel, streamlined coaches built by Budd in 1940. They served systemwide on the Burlington in various trains. 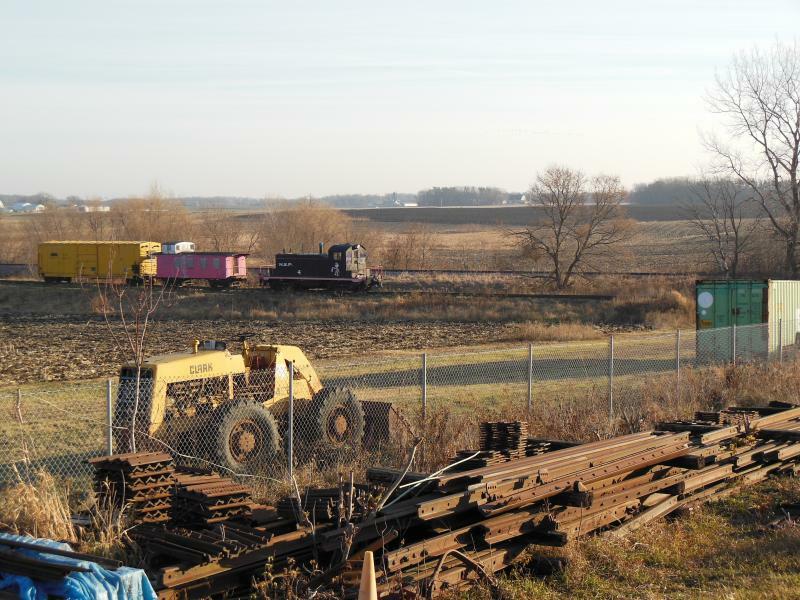 After the Burlington Northern merger, BN retained them for maintenance-of-way service. Seats were removed and oil heaters installed. 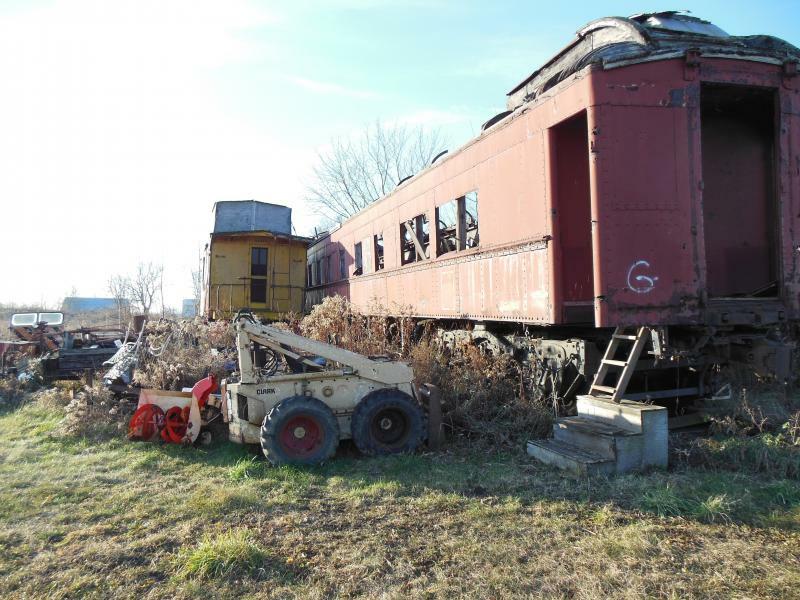 Both cars are currently stored offsite awaiting funding for transportation and restoration. GSRM doesn't know much about Soo W725's history. 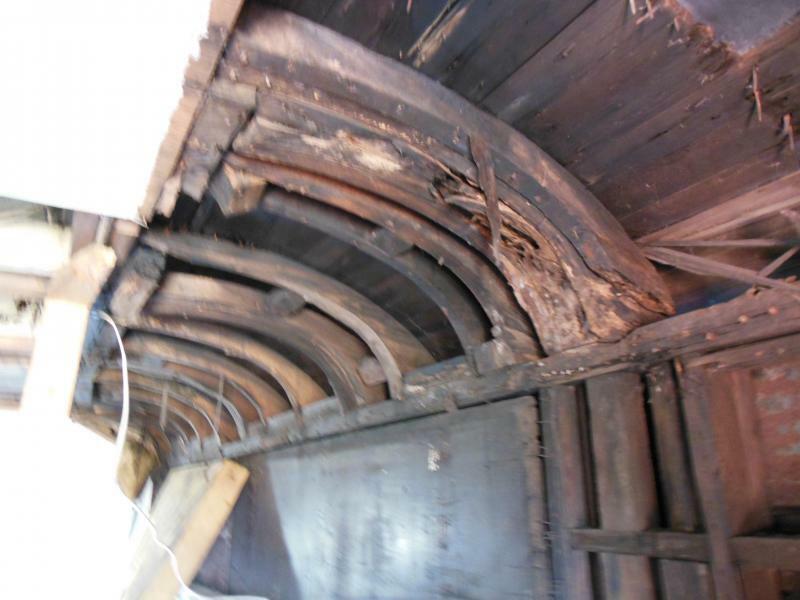 It's about 70ft long and appears to have been built around the turn of the 20th century. Soo W725 is a wood, truss rod car and has been retrofitted with a Barney & Smith steel underframe kit. 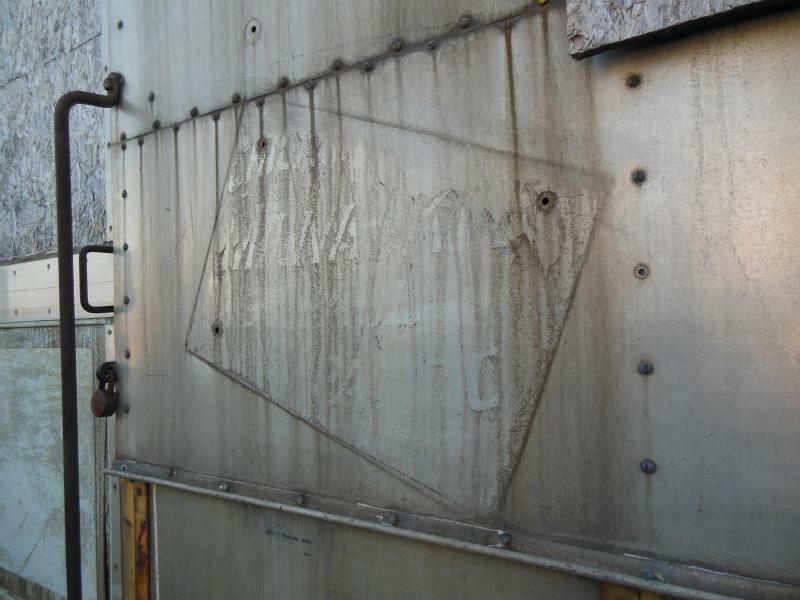 The paired window pattern implies it might have been an open section sleeper at some point, but was was pressed into work service as a bunk car when it was acquired for that purpose by the Soo Line in March 1948. The car is still pretty solid, but really needs to be inside a building fairly soon until it's restored. Volunteers have done the best they could to seal the roof from the weather. Soo W725 is a unique car from an era of which not many cars are left and deserves to be saved. Wisconsin Central coach 1954 was built by Barney & Smith in 1914. It's in a class of early steel coaches received by Soo/WC. 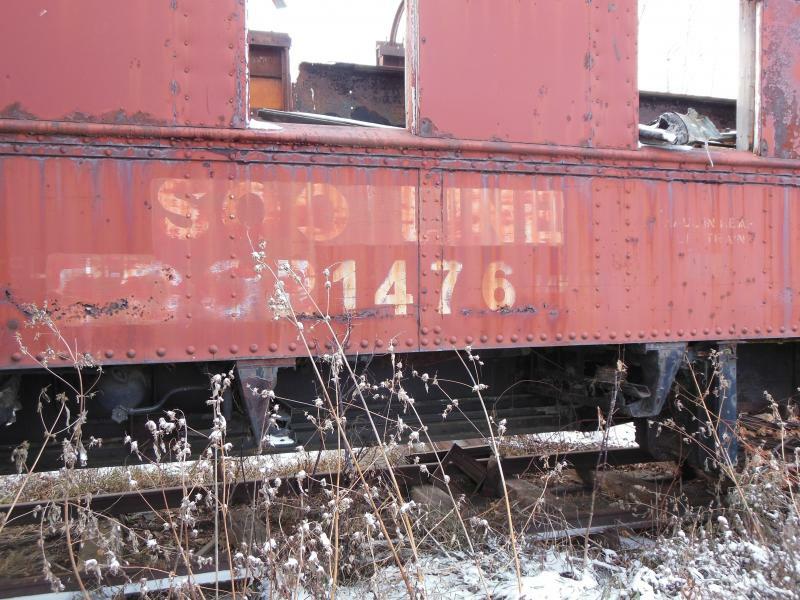 It spent its career on several of Soo Line's various passenger routes and was last used in company service as bunk car Soo 1476. Unfortunately, neglect in securing the roof of this car resutled in its collapse. At one point, GSRM board-of-directors had instructed volunteers to scrap the car. A change in board stopped the project before it got very far along. The future of this car is uncertian. 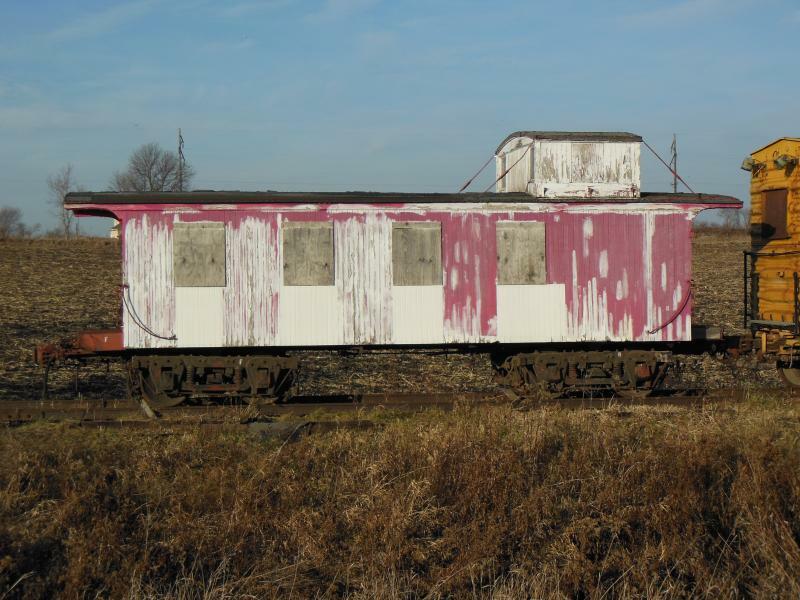 Because of its heritage as an early steel car, it would be good to restore it to its as-built configuration. This is an expensive proposition and at this time, WC 1954 sits in outdoor storage as you see it. At one time, some of the nation's fastest trains were the mail trains. Often their consists ran 15-20 Baggage Express and Railway Post Office cars, punctuated by a handful of coaches. They operated as first class trains and often more than one section. 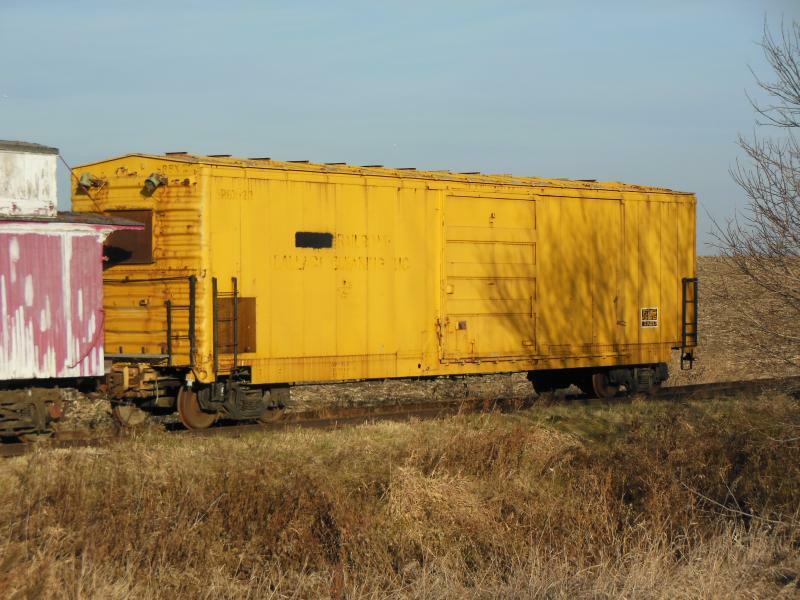 Today, very few Railway Post Office cars remain. 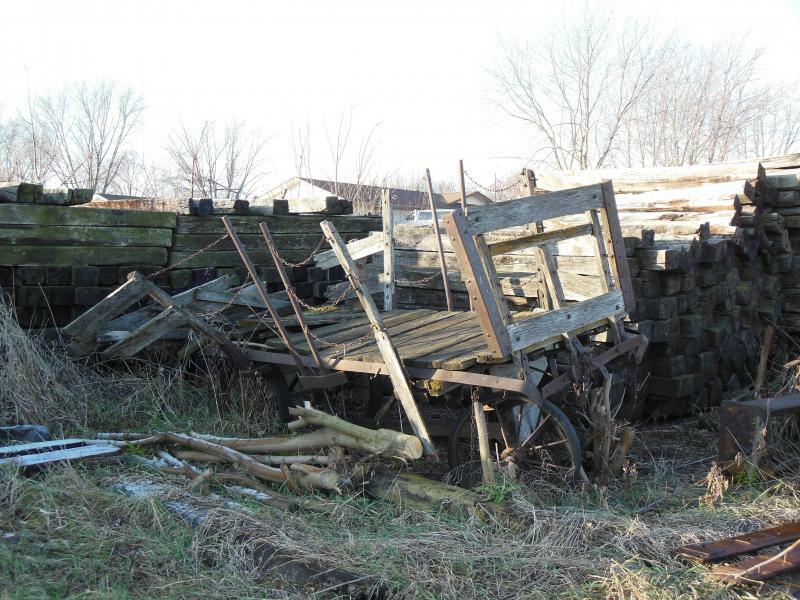 GSRM's example is a wood car that was rebuilt in the late 1910s or early 1920s with a steel underframe. GSRM doesn't know what number the car is, it was either painted over or obliterated so not much is known about its history. A contractor sandblasted (yikes! it's wood) the car and painted it in Chicago & North Western colors. It sat in front of Bandana Square for about 10 years with a Grand Trunk 0-8-0 steam locomotive. A change in ownership and focus for Bandana Square saw most of the rail equipment on the property disposed of in the late 1990s. GSRM was able to acquire the RPO car. Currently the RPO serves as a shop and storage car for GSRM. Volunteers keep doing the best they can to keep the roof sealed. It really needs to go inside a building for complete restoration. Chicago Burlington & Quincy waycar 14534 was built by the Burlington in December 1871. It's the oldest piece on the property. It was originally built as drover's car CB&Q 79. As a drover's car, it had seats and bunks for ranch hands accompanying cattle to market. Drover's cars were common on most midwest and western roads that served the cattle industry. By the 1910s and 20s, the Burlington began using coaches as drover's cars and 14534 was reconfigured as a standard waycar along with other Drover's waycars. It received a steel underframe somewhere in the same time frame. CB&Q 14534 served nearly 100 years on the Burlington and survived the BN merger to become BN 11065. It was retired in 1976. BN donated 11065 to the Minnesota Transportaton Museum. MTM was forced to place it in outside storage in 1983 when it's BN Como Shop Home closed and MTM moved its operations to the Minnesota Transfer Roundhouse. In 1996, CB&Q 14534 needed to move again, it's "temporary" home was being redeveloped. CB&Q 14534 was donated by MTM to GSRM and moved to Chaska, MN where it was stored until 2008 when it was moved to New Prague where it resides today. Oh -and why does it look like a caboose, but it's called a waycar? Well, is it a pail or a bucket. It all depends where you live, or in this case who you work for. 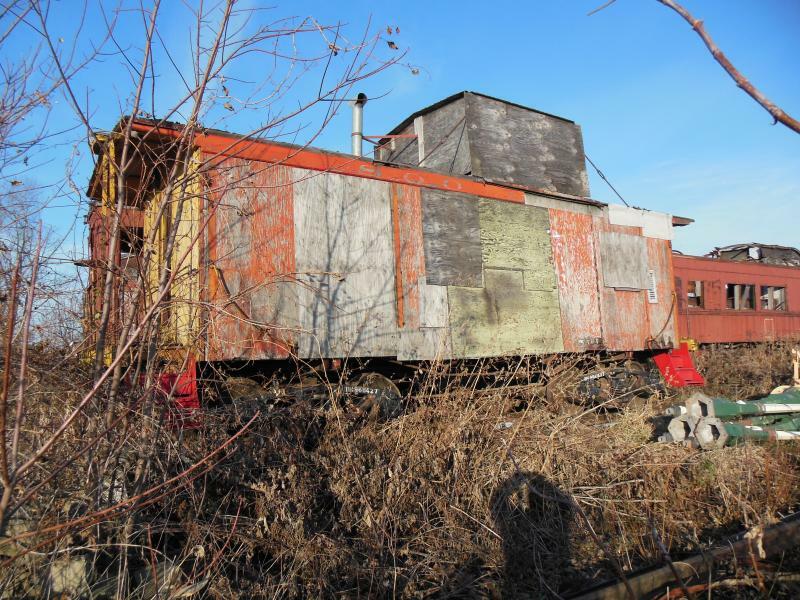 On the Burlington (a few other roads as well), the caboose was always referred to as a waycar, never a caboose. Why is lost to history, but that's the way it was. After the BN merger, old GN, NP and SP&S employees always knew who had been a "Burlington Man" by how he referred to the "waycar". Milwaukee Road 992147 was built in 1956 by the Thrall Corporation as MILW 02147. 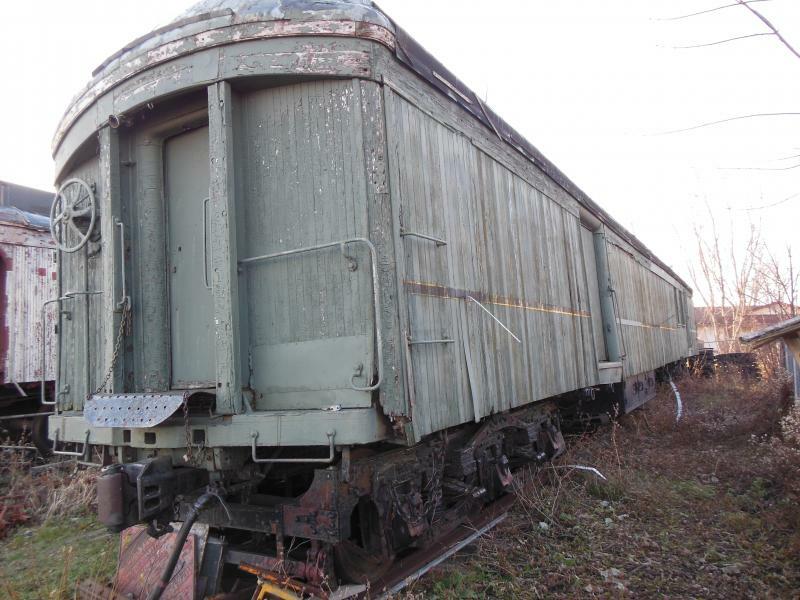 This series of bay window cabooses were the first steel bay windows purchased by the Milwaukee Road from an outside vendor since it first perfected its own design. Milwaukee Road waycar numbers began with a zero until the early 1970s when "99" replaced the zero. This was done so the car numbers were usable in Milwaukee Road's car tracking computer system which couldn't accomodate numbers starting with zero. People often ask, " what are the angled steel plates for?" The 1956 Thrall cars came equipped with electric lighting, including markers. The electric lights caused more glare than the old kerosene lamps. The shields cut down the glare so crewmen could see better out the windows. Electricity also meant the cars could be equipped with radios and the cars originally sported large "wagon wheel" type radio antennas on the roof. MILW 992147 has been repainted once by GSRM volunteers, unfortunately, the paint didn't hold-up well and it's already faded badly in a short time. WC 99114's post railroad history is probably more coloful than it's 60 odd years on the railway bringing up the rear of WC/Soo freight trains. WC 99114 was retired by the Soo in the early 1970s and purchased by the Dosedel Family. It resided in their back yard in rural Minnesota north of Minneapolis for more than 30 years and was not only a neat play house for their children, but the local children as well. 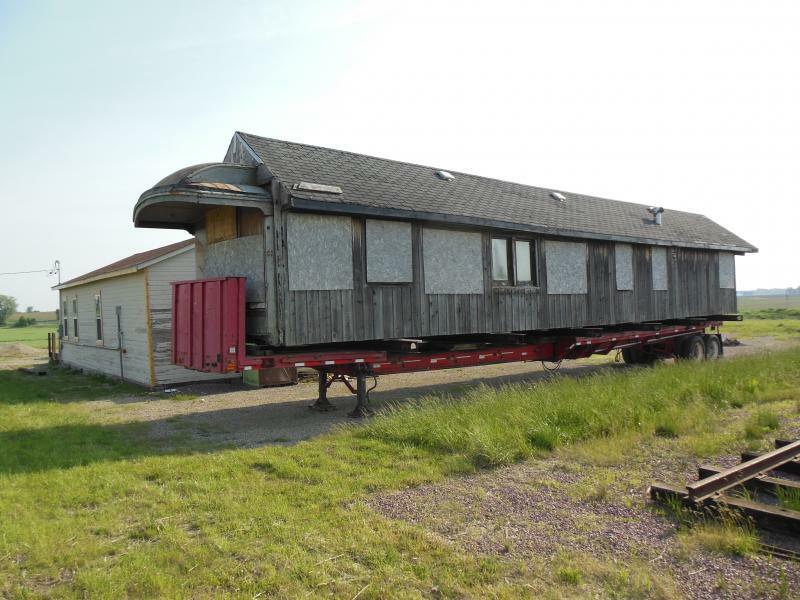 The local newspaper ran a feature story on the caboose's move to the Dosedel home. Pictures showed the car being hauled by a truck, trailed by a number of kids walking and riding bicycles. It was instanly a local fixture in the community. 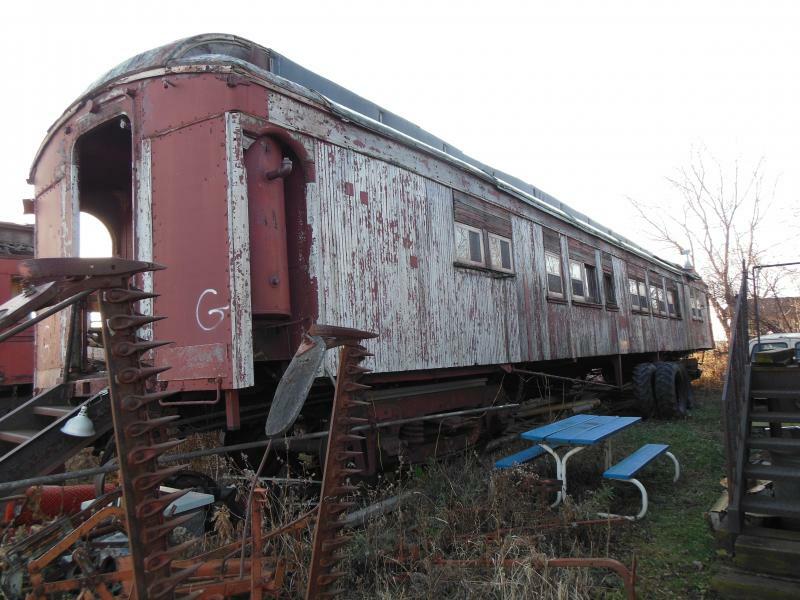 For many years the Dosedel's hosted halloween parties for the neighborhood children in the caboose. Creative use of cardboard shapes turned the area under the coupola into a zoo and children donned animal costumes to portray the zoo animals. Dracula and his coffin took over the conductor's desk and bench next to it. Dry ice in the stove created fog to set the atmosphere. Even after the family donated the car to GSRM, area residents showed up at their home in the fall asking about the Halloween Caboose event. The car sat next to a pond in the Dosedel back yard. 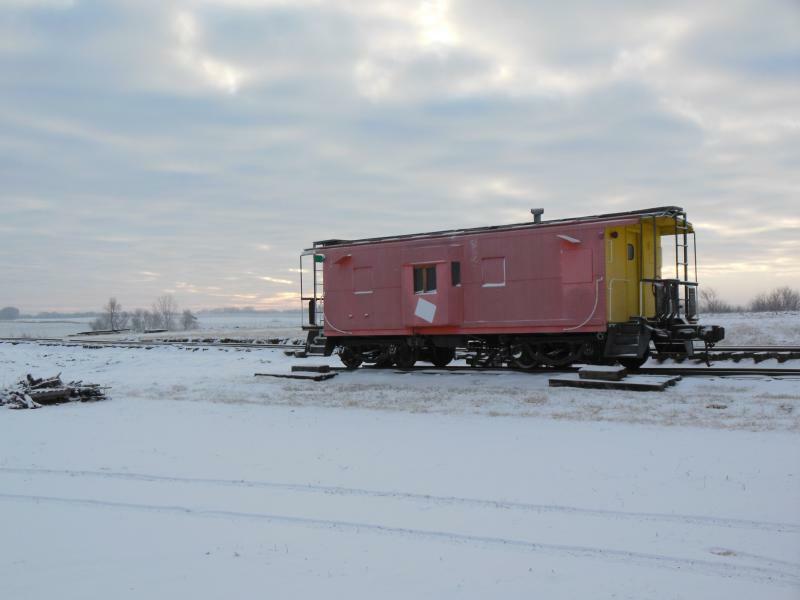 In the winter months, the old caboose served as a warming house for area kids coming over to play hockey and skate on the frozen pond. The senior Dosedels, Joan and Don, grew up near Ladysmith, WI along the Soo Line and often rode the train to school in a caboose. Joan recently came across some old Soo Line records showing caboose assignments and was surprised to find WC 99114 had been assigned to Ladysmith during the same time period she was going to school. Joan is pretty certain she rode WC 99114 a number of times as a child. What a coincedence that many years later her family would own the car and her children would also get to experience it as well, albeit in a slightly different way. The Dosedel children, John, James, David & Robert donated the car to GSRM in approximately 2001 and it was moved by truck to New Prague. It's sitting on CB&Q 70 ton freight car trucks until suitable arch-bar trucks can be found or built. WC 99114 is unique in that it's very complete inside and out with the exception of trucks and couplers. All the original furnishings are still inside including the caboose stove. Wisconsin Central was a subsidiary of the Minneapolis, St Paul & Saulte St Marie Railway (Soo Line). Common management meant common philosophy on a number of things, equipment design being one of them. 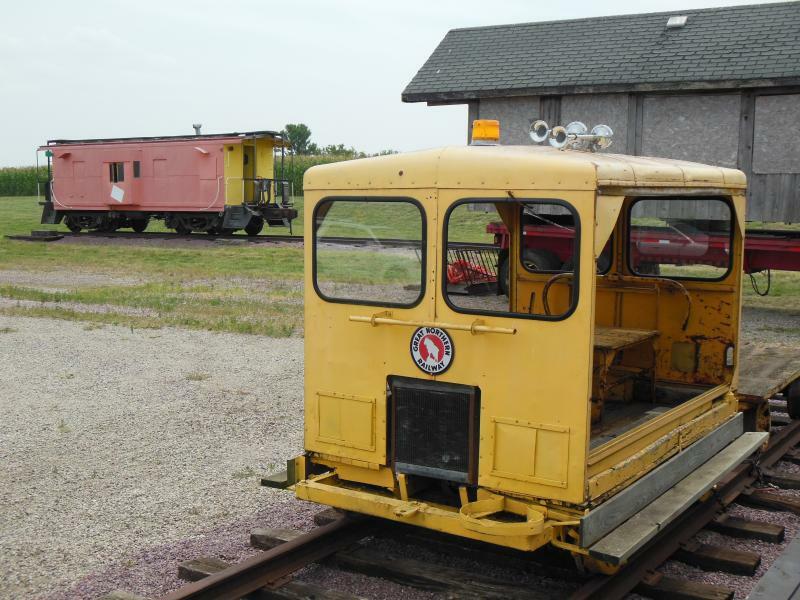 WC waycars were constructed to the same basic plans as the Soo Line cars. Observant Soo historians can mot likely point out subtle differences between Soo and WC cars, but to a casual observer, they look alike. WC9914 was built in 1911. 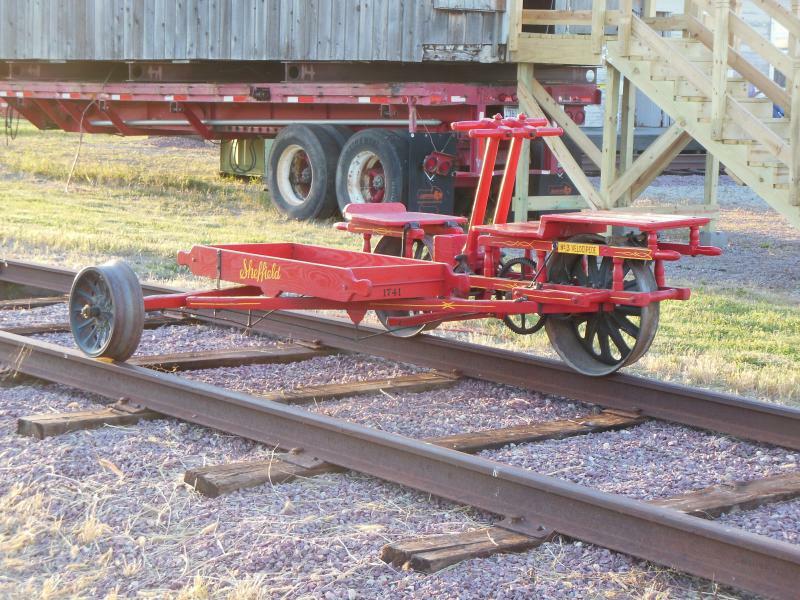 It would have had a wood, truss-rod underframe and arch-bar trucks. It kept the arch-bar trucks and truss-rods throughout its career, but was rebuilt with a steel underframe most likely in the 1920s or 30s. In the 1960s, many of the Soo/WC waycars were resided with plywood replacing the wainscoting in order to save money and make them a little more sturdy and maintenance free. Plywood was also applied to the interior at this time as well. About the same time as the plywood siding was added, the paint scheme was updated with large block "SOO" replacing the familiar dollar sign herald. 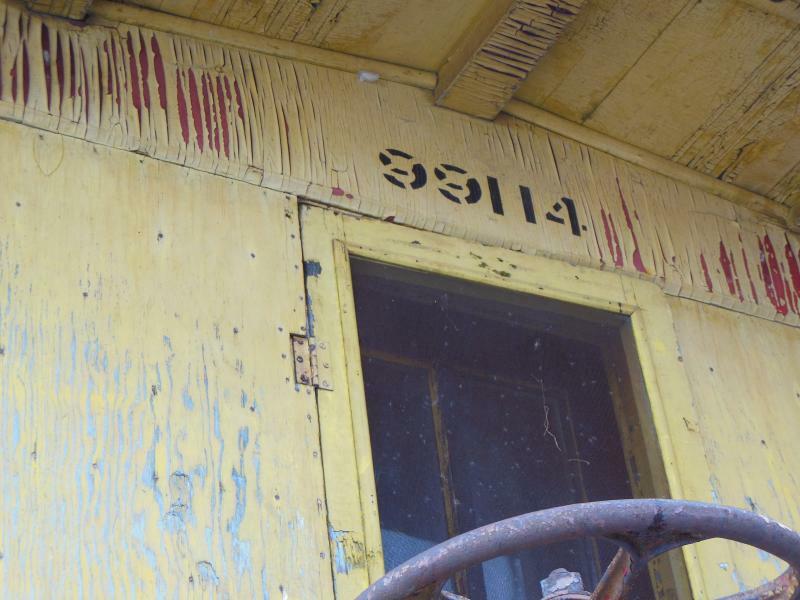 Both paint schemes are visible through the peeling paint on 99114. 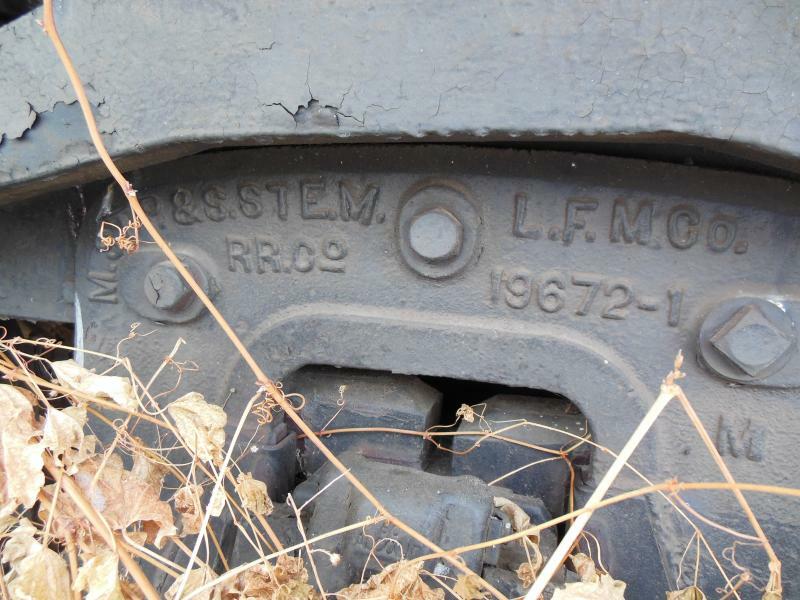 As a general rule, WC locomotive numbers were a 4-digit number. There were more exceptions in the steam era, but most diesels were numbered in the 2000 series with WC initials. Waycars were identified similarly. As a general rule, WC waycar numbers had a "99" prefix and were sublettered "WC" in the corner of the letterboard. 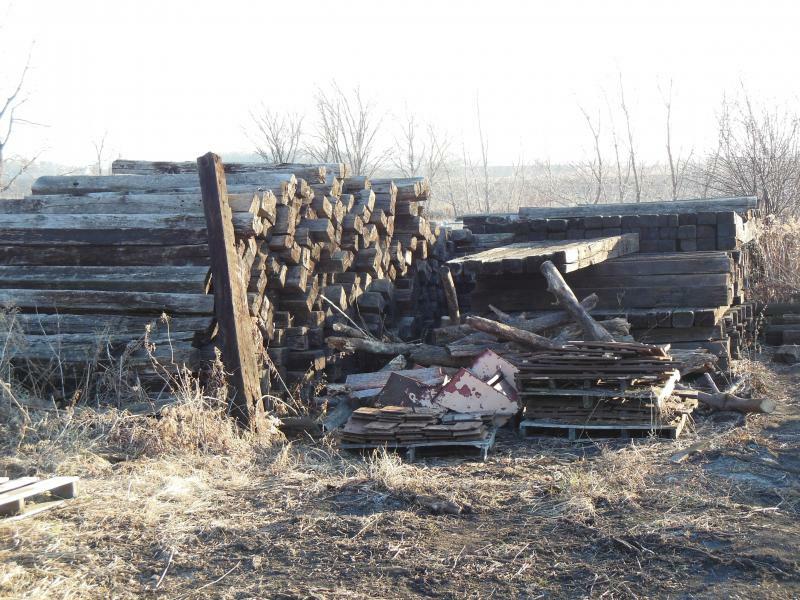 Just like all the other wood equipment on the property, it needs to be in a building and fully restored, at this time it's sealed against the elements as best as can be. 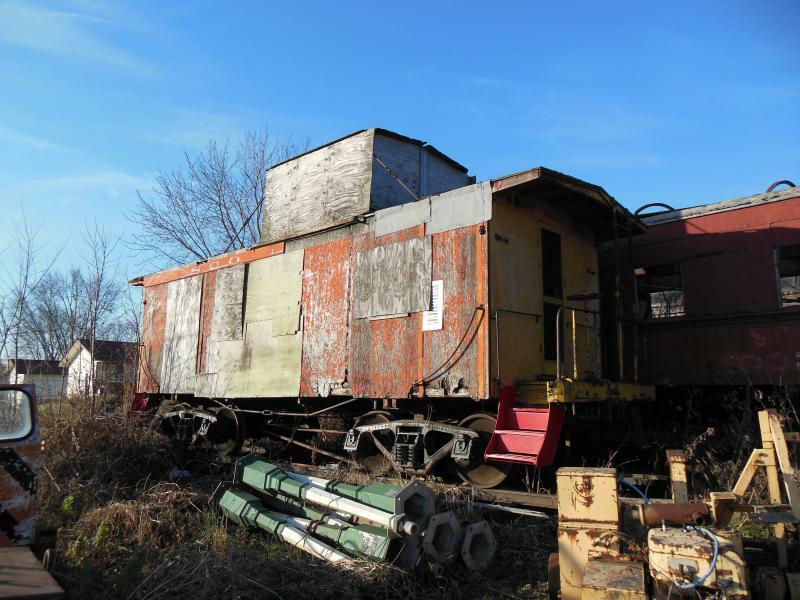 GSRM doesn't know too much about the history of SRBX 23 other than it's a 50ft box car built in 1950 for the Pennsylvania Railroad. It's equipped with Superior doors. Box car red and Pennsy/Pen Central Jade green paint show through the Sperry yellow. Sperry Rail Services is a large company providing track maintenance and rail grinding service to North American railroads. It purchased the car sometime in the late 70s or early 80s for use as a mobile shop. It's equipped with overhead cranes inside as well as electrical outlets, lighting and a space for a generator and compressor. It's also equipped with external shop air lines. 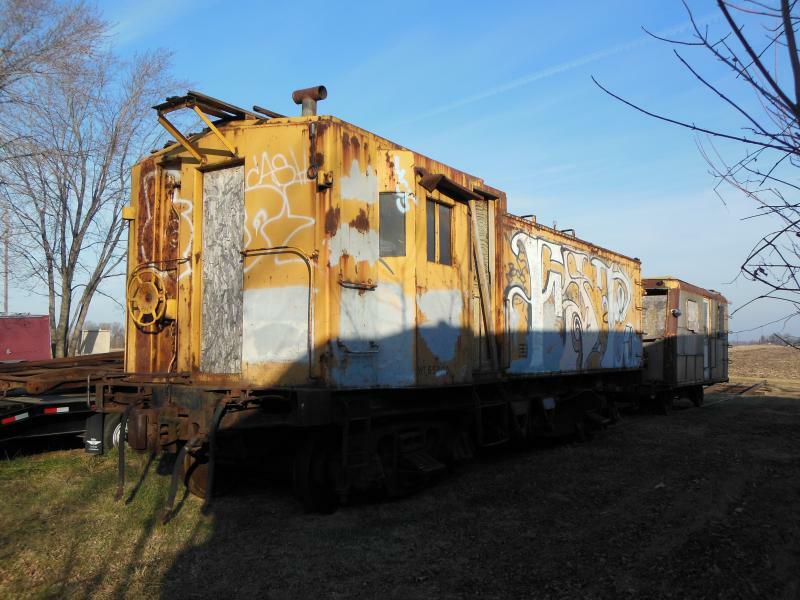 GSRM has moved SRBX 23 to the north end and will use it as a shop/tool car. It may get a new paint job in the next year or two...maybe M&StL red and white. We'll see. NSP 4 rolled out of the Electro-Motive Corporation La Grange, IL erecting hall in 1940 as brand new CB&Q SW1 9146. By the early 1950s, CB&Q had sold 9146 to subsidiary Colorado & Southern as C&S 155. Apparently the SW1 was a restless soul, it moved again in the early 1960s to CB&Q subsidiary Fort Worth & Denver as FW&D 103. It became BN 103 after the BN merger and found its way to Minneapolis. A number of people photographed it in storage outside the former GN Minneapolis Junction Roundhouse in 1973. BN sold it once, but the deal fell through. BN finally found a buyer in Norhern States Power company. 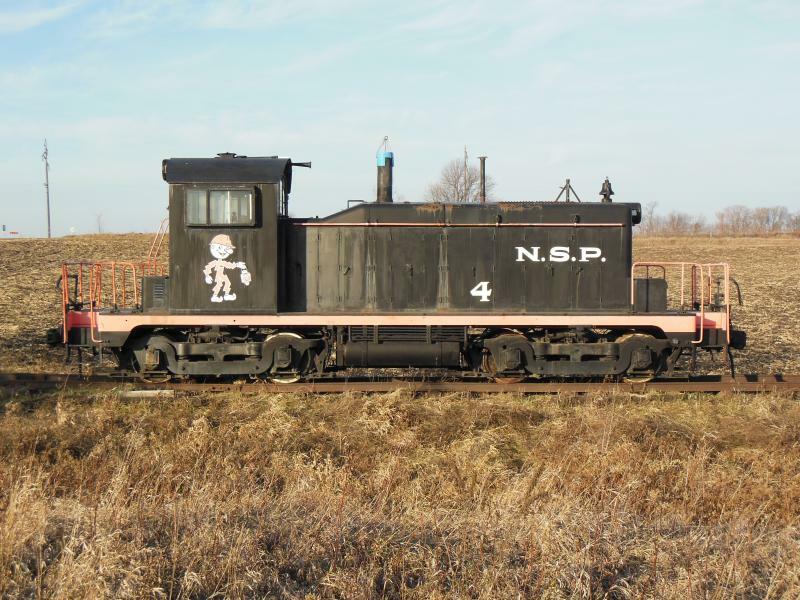 Repainted as NSP 4, it became a fixture at NSP's St Paul High Bridge power plant, drilling (switching) coal hoppers day and night. The unique paint job featured NSP's mascot Reddy Killowatt on the side of the locomotive cab complete with hard hat and railroad lantern in hand. By 1996, NSP was ready to retire the 56-year-old locomotive for something a little newer and a little higher horsepower (SW1's V6 is rated for 600hp). In the 1980s, NSP sold the rights to Reddy Killowatt and his image was supposed to be removed from all company equipment, etc. The High Bridge crew couldn't bring themselves to paint over Reddy so they ignored the memo. Later, NSP briefly revived Reddy Killowatt and officials were surprised to see him still working hard at the High Bridge plant. 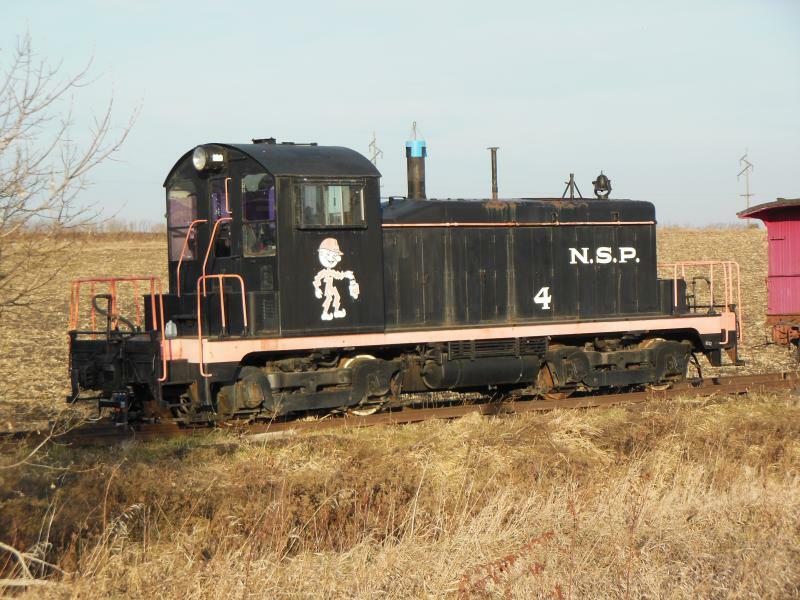 Realizing Reddy was an important icon to NSP history and highly recognizable to a generation of a certian age and older, NSP generously donated the locomotive to GSRM in working order to preserve NSP 4. 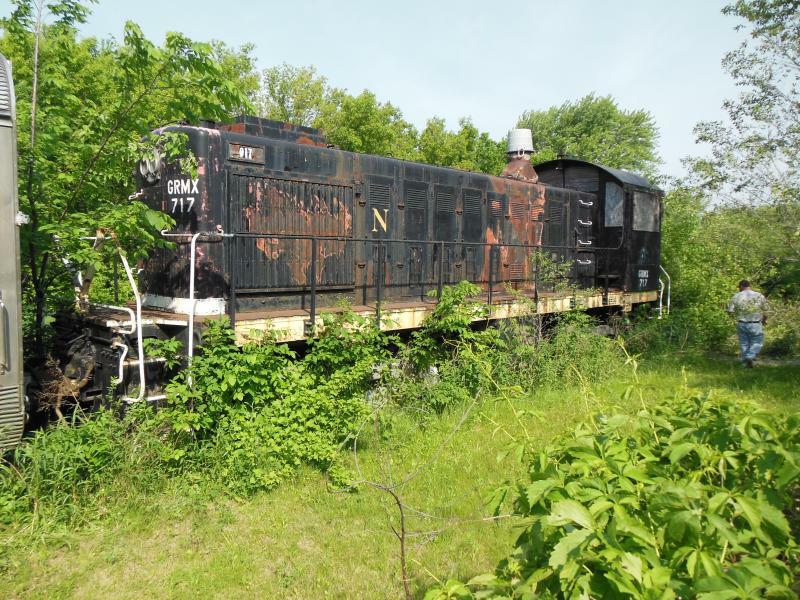 While it would be nice to see it operate as CB&Q 9146, it was known to a few generations of Twin Citians and NSP employees at NSP 4 and it will remain NSP 4 because of its place in Twin City history. 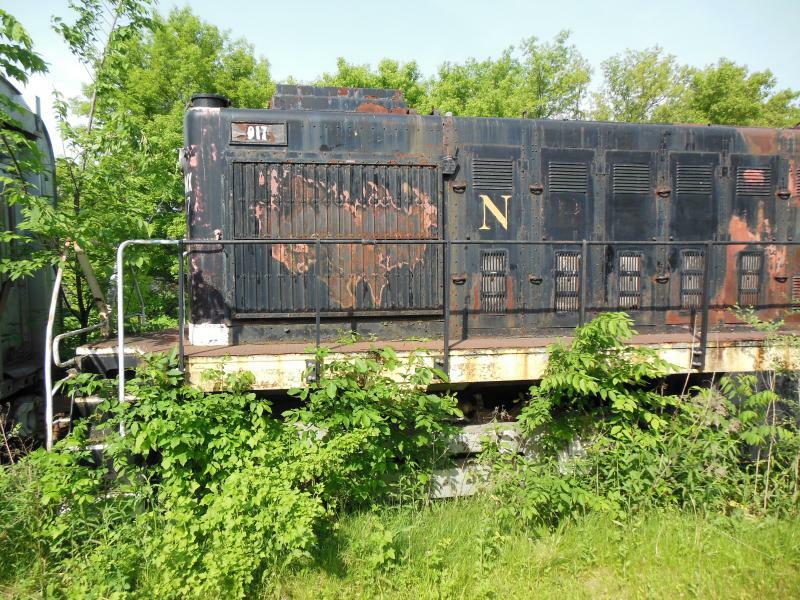 NSP 4 was stored for many years in Chaska, MN and only fired up occasionally. It's been stored in New Prague since 2008 when it arrived by truck. It was fired up in 2012 and ran for about 15-20 minutes until it ran out of fuel. Turns out the emergency fuel shut-off had been pulled during moving it and was overlooked. 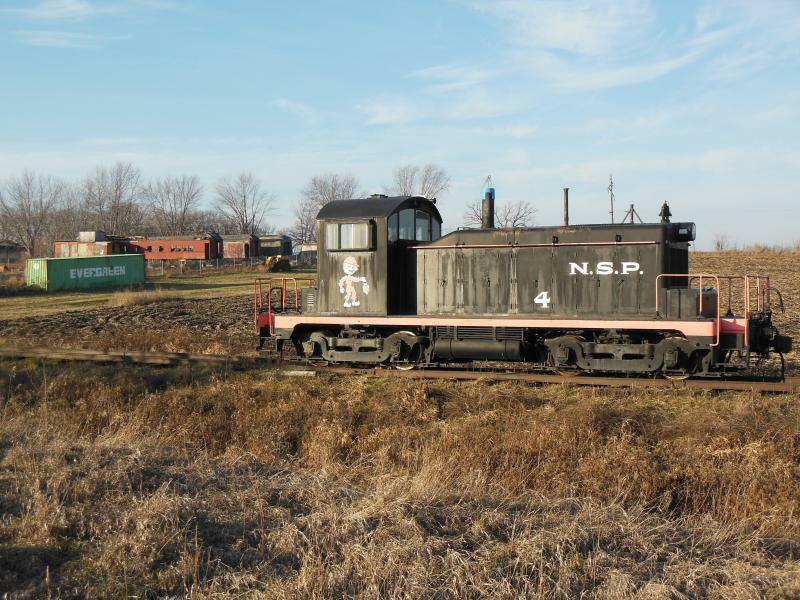 NSP 4 is operational and was used as power for train rides during the 2014 season. Northern Pacific Alco S4 717 spent most of its career working the Twin Ports terminal of Duluth, MN and Superior, WI. It was built in 1954. It became BN 917 after the BN merger and was sold to Hyman Michaels for scrap in 1973. 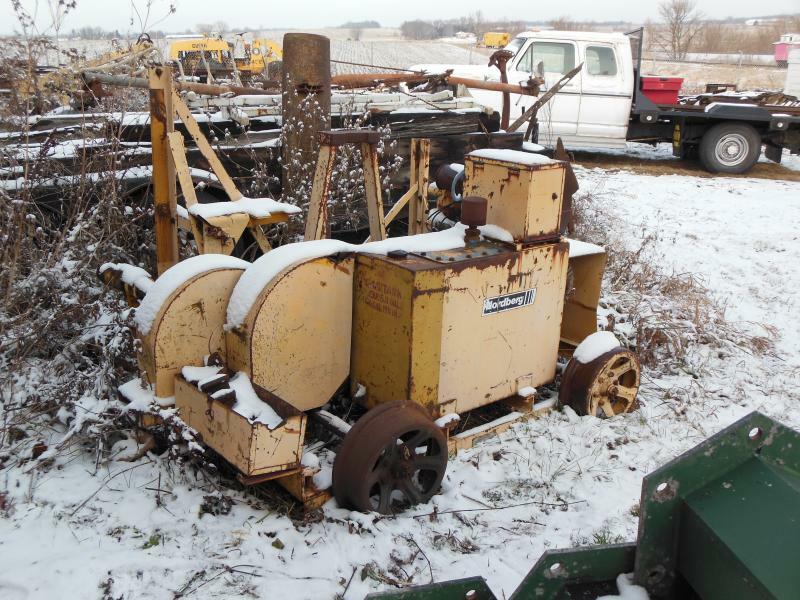 It was resold to the Sounthern Minnesota Beet Coperative and worked many years in Western Minnesota shuffling cars of sugar and sugar beets. 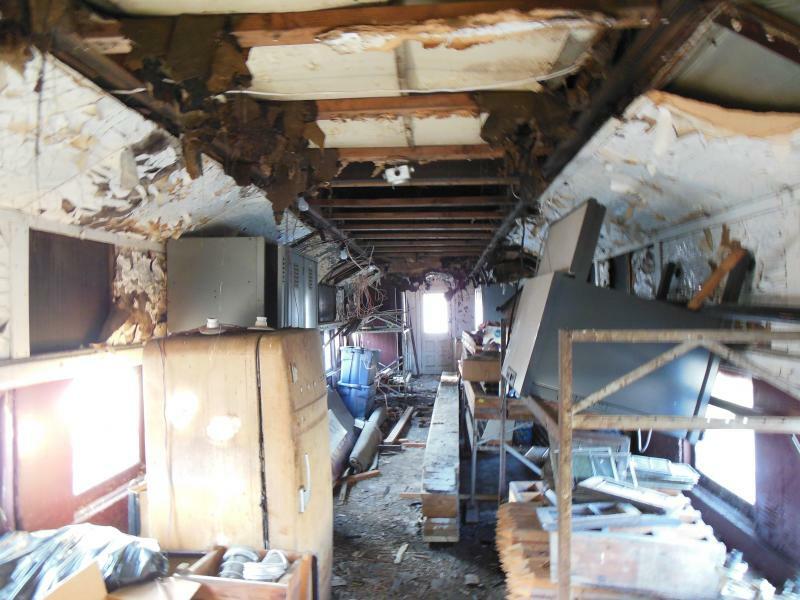 An electrical fire related to a "hot start" aparatus sidelined the locomotive in the late 1990s. 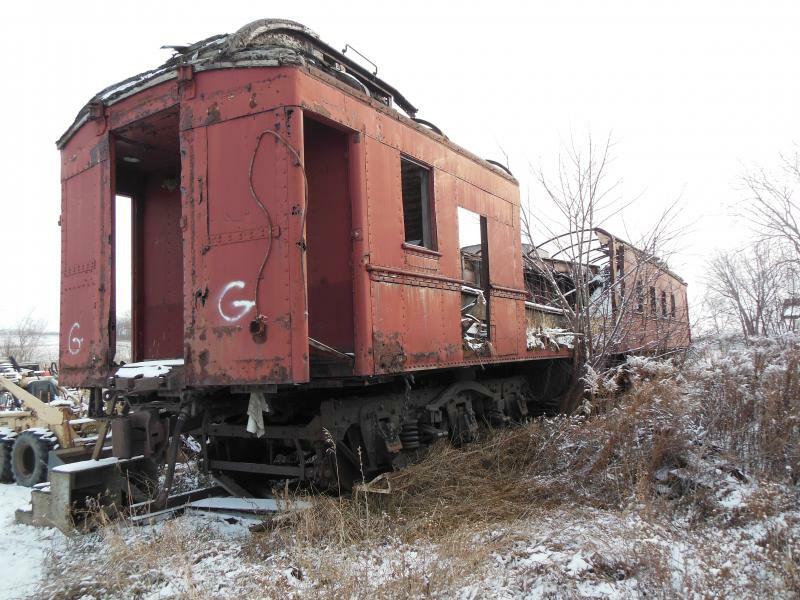 It was about to be scrapped when GSRM became aware it may be available and asked SMBC to donate it to GSRM. They said yes, but gave GSRM just a few weeks to move it or it would be scrapped. It wasn't operational, had no walkway railings, a broken spring and it was February. If you live in the upper midwest, you know what that means. 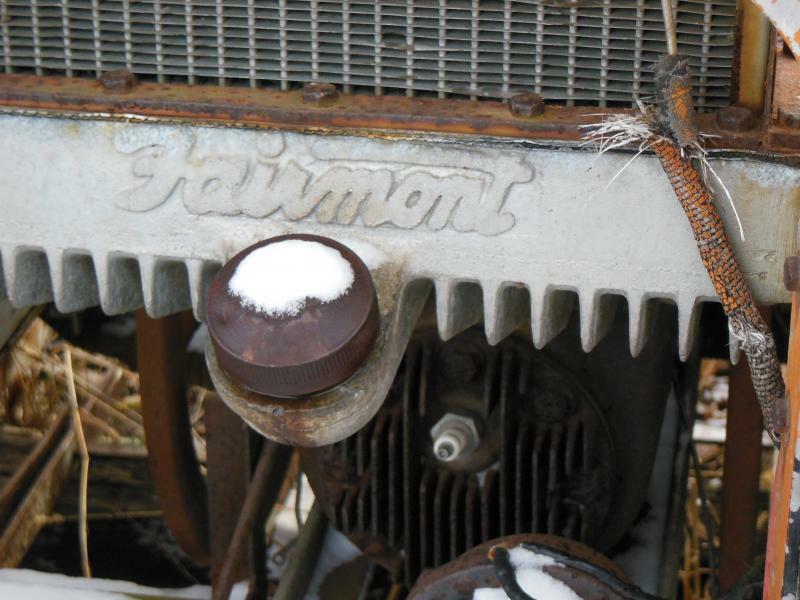 The locomotive was encased in ice and snow. The FRA inspected the locomotive and said it wasn't going anywhere with the defects. GSRM volunteers discussed the situation with the FRA, that time was short. 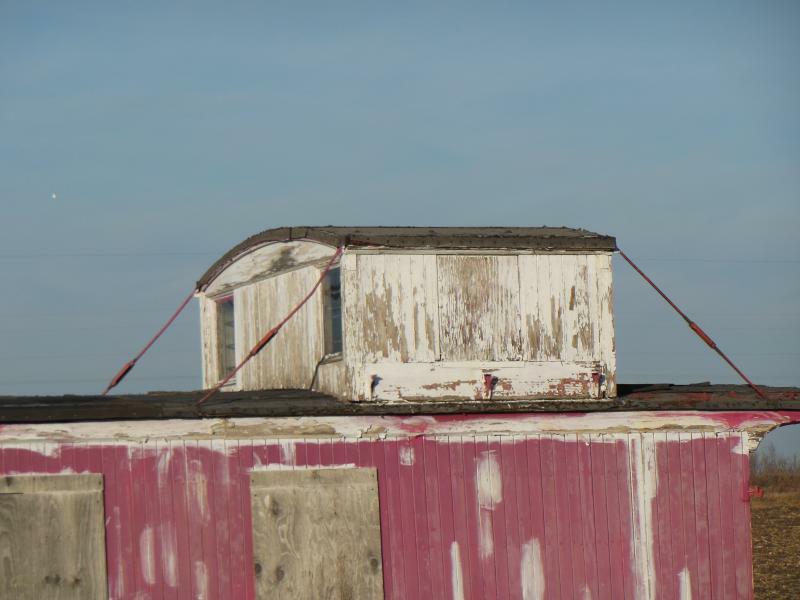 The FRA and TCW agreed to a special move to Bird Island, MN where it could be stored on a siding until FRA approved repairs were made. The FRA waived the hand rails and allowed a field repair to the broken spring and 717 was on its way again to the Minnesota Commercial roundhouse in St Paul, MN. At the MNNR, volunteers repaired 717's pilot and steps, replaced the missing hand rails and adjusted its brakes. 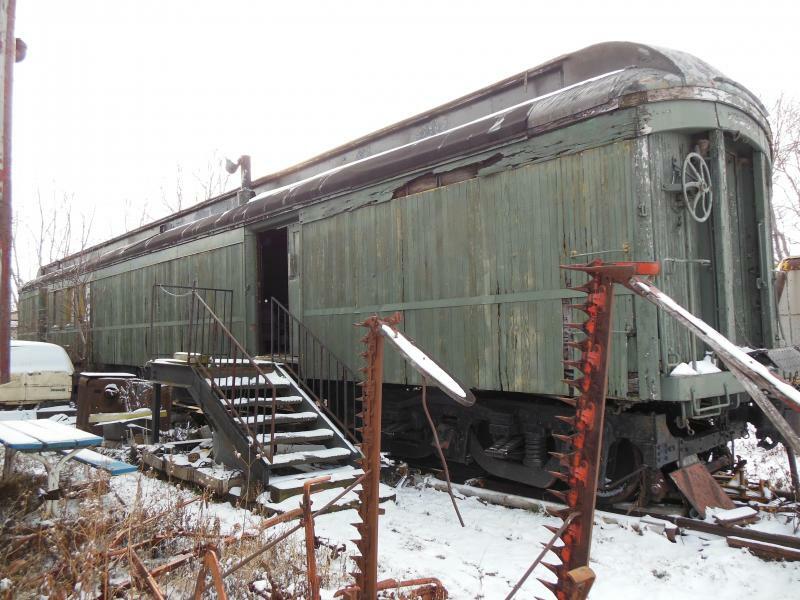 The FRA and Union Pacific approved its move to Montgomery where it's currently stored awaiting funds to move it onto museum property. 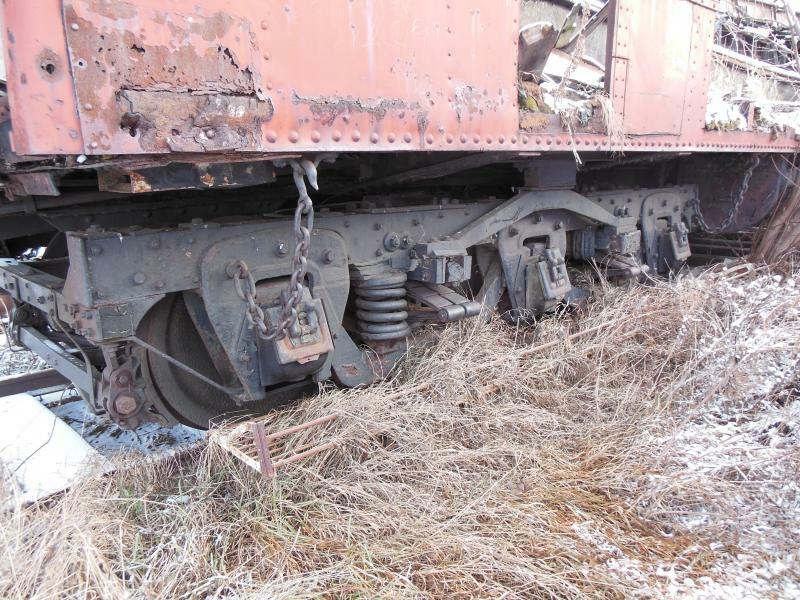 Milwaukee Road Wire Car T1 is somewhat of a mystery as to it's origins. Not much information has been found describing when it was built or what it was built from. 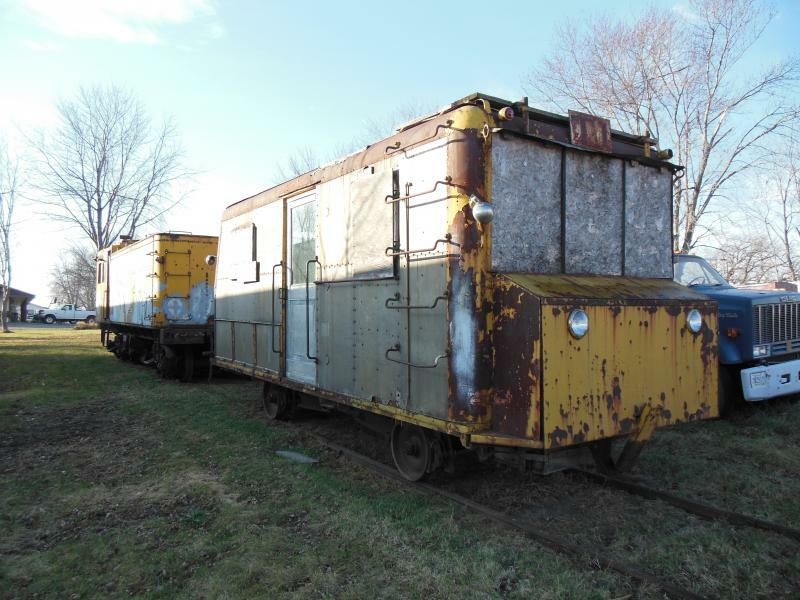 It appears to be the motive power section of an old, two unit Buda track inspection car. 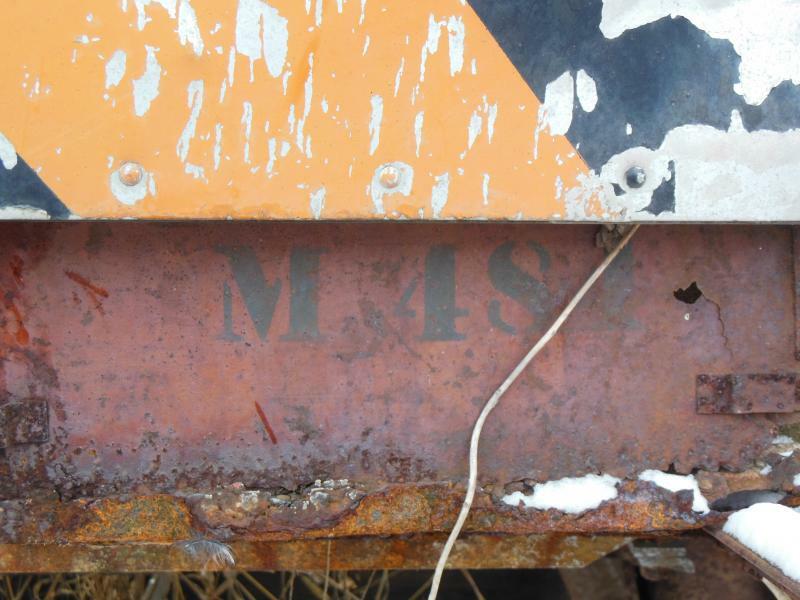 A painted on Milwaukee Road hearald is still visible featuring "Chicago, Milwaukee, St Paul & Pacific" rather than "The Milwaukee Road". Milwaukee Road switched to the later version starting around 1954, dating construction of T1 to prior to 1954. Original colors appear to have been orange steel work with aluminum side panels, black underframe and a painted on CMStP&P herald. The wood window frames appear to have been green. At some point after 1954, T1 was painted in the UP Streamliner colors, maintining the aluminum side panels and black underframe. A new "The Milwaukee Road" herald was bolted over the old one (since removed by vandals while it was in storage). T1 was equipped with an extendable work platform on its roof. The purpose of the wire car was to service the catenary on Milwaukee Road's electrified divisions. T1 is equipped with bins and tool boxes to house all the tools and spare parts needed to service the overhead wire. GSRM hasn't found much information regarding where T1 was primarily assigned and worked, but based on stencils inside the car, it appears to have been assigned to the Coast Division when it was retired. The wires came down on the Pacific Coast Division in mid 1970s and T1 was likely retired at that time. 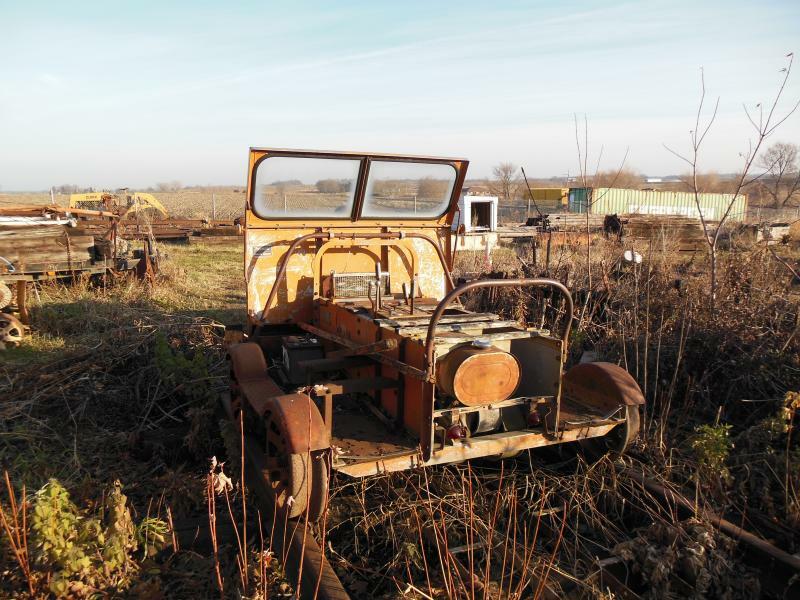 Plans call for restoring the Buda diesel powered car to operation as funding is available. 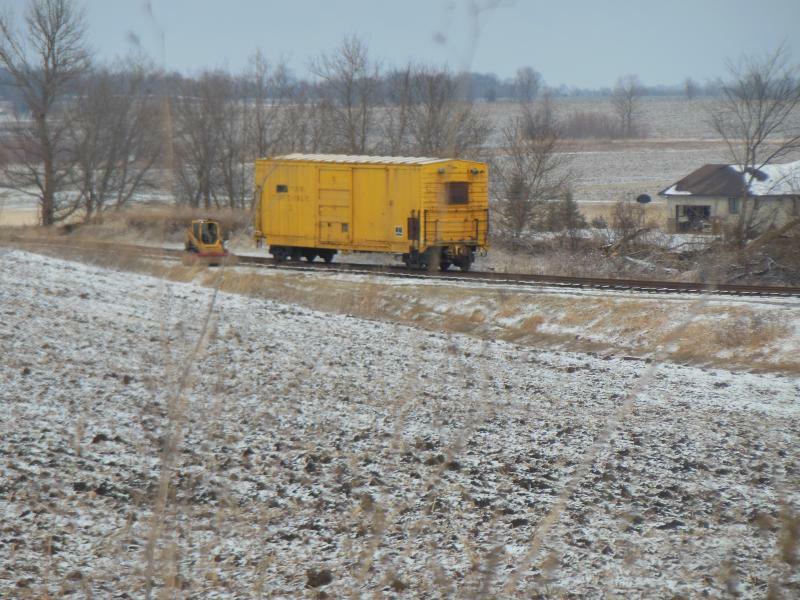 All the mechanical componenets are intact, but the radiator was damaged by a runaway hopper car while it was sotored in Chaska at United Sugars. This is really a former Minnesota Transfer Railway Fairmont Gang car. The GN sign, horns and beacon were added for a special event and aren't original. 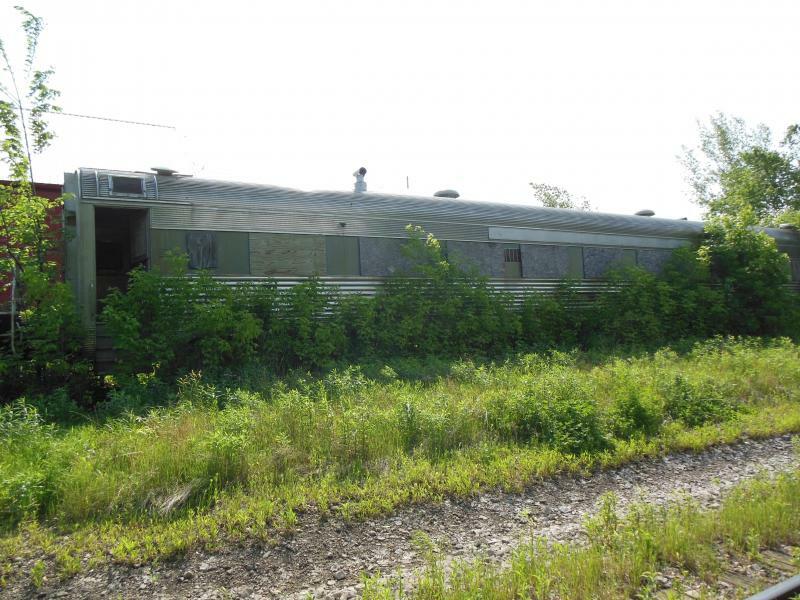 This Duluth, Missabe & Iron Range M19 Fairmont Inspection Car was running when GSRM acquired it. Unfortunately it's been left in OUTSIDE storage for several years and needs major work. It's on the list as a winter project if we get the shop car set-up on the north end. GSRM owns a velocopede like the one pictured above. 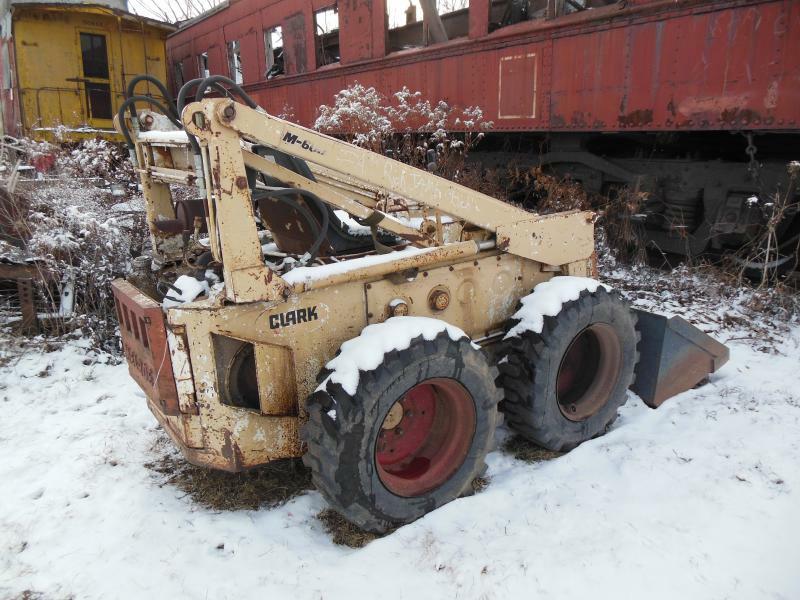 It was on loan to Dakota City Heritage Village located at the Dakota County Fair Grounds in Farmington, MN, but it's back home in New Prague awaiting restoration to operation. The velocopede pictured above is privately owned and was displayed during the BRHS Annual Meet visit in September 2012. 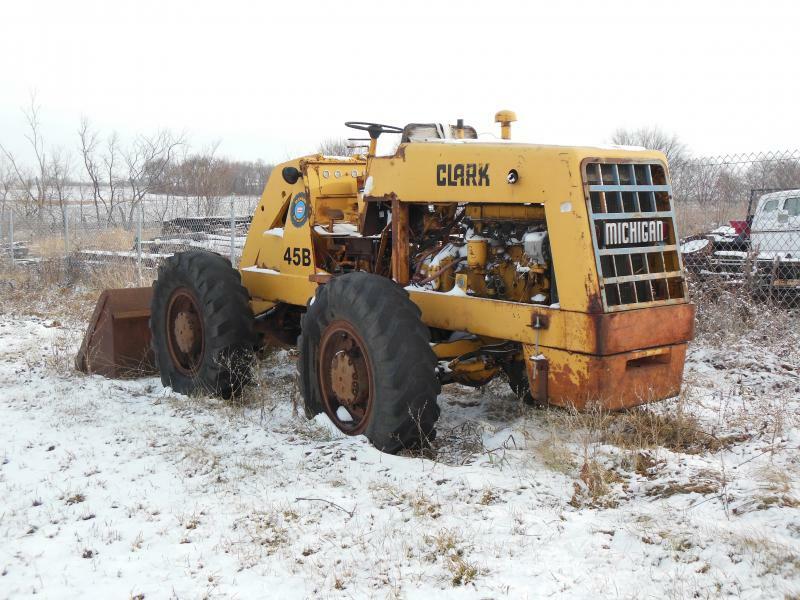 This unusual looking piece of equipment is a snow flanger. 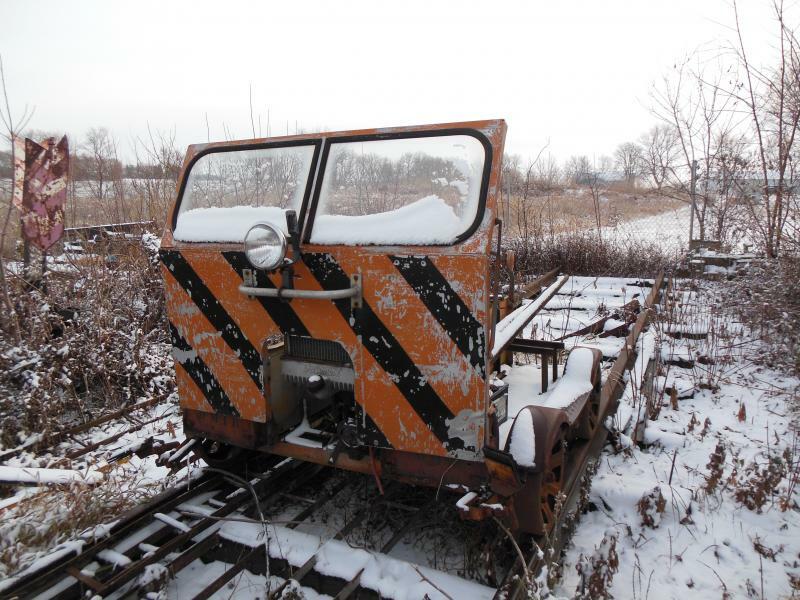 Snow flangers are important pieces of rail equipment in northern climates. The flanger is equipped with a plow (two in this case so it can operate either direction without being turned) that fits between the rails and clears snow from between the flangeways. The plows are raised and lowered by air actuators with air supplied by a locomotive. An operator rode in the bay windows and watched for obstructions between the rails such as swiches and grade crossings. Signs along the right of way alerted crews when to raise the plow blades. 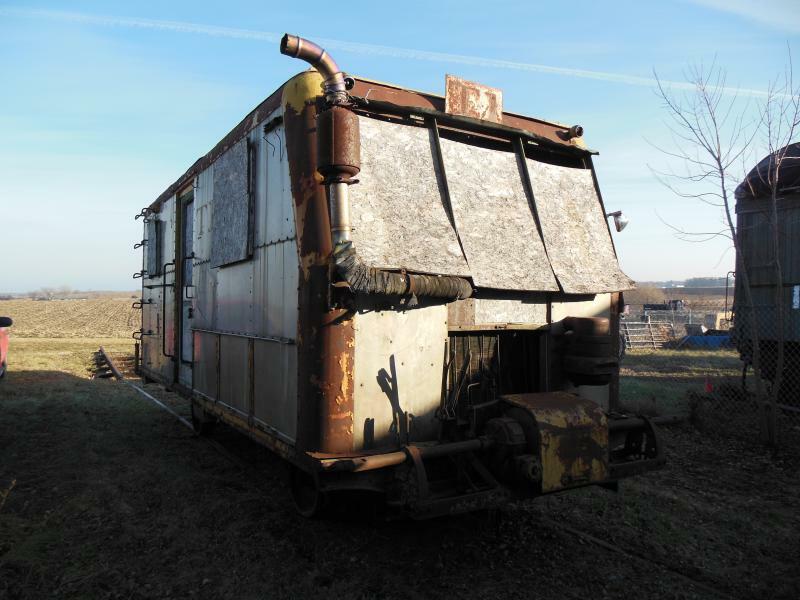 Flangers come in various forms, often rebuilt from old boxcars. This one is rebuilt from an old Milwaukee Road, class L2 Mikado steam locomotive tender. The flanger would be towed behind a locomotive. The flanger crew usually consisted of a locomotive or two, the flanger and a caboose. 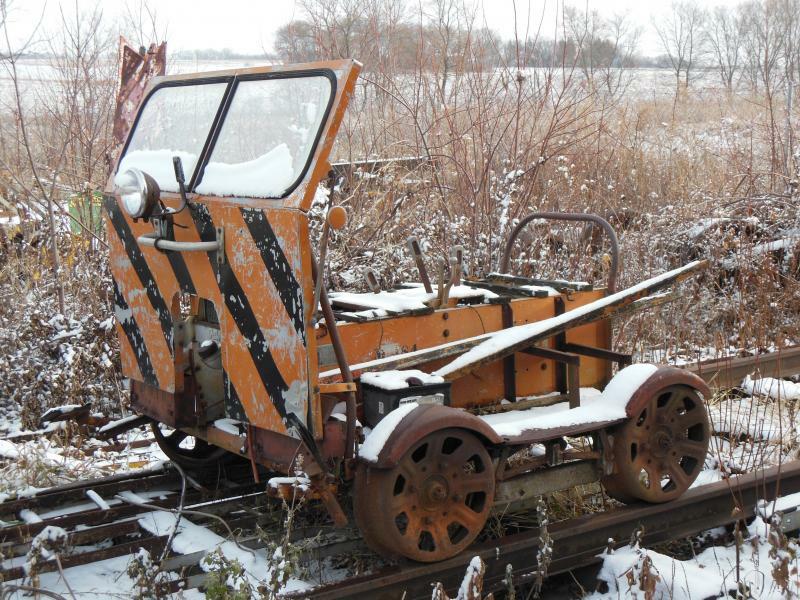 The flanger would be used after a plow had cleared the track. 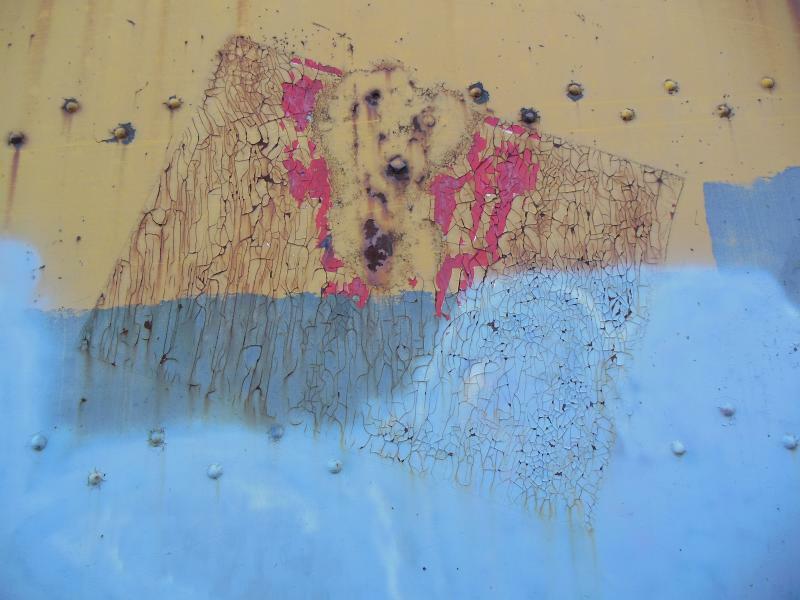 Ghost of the Milwaukee Road Steam Era comes through peeling paint. Long live the CMStP&P! This old C&NW Chevy Suburban Hy-Rail truck was donated to GSRM in the 1990s. It was complete and running at the time. It was sent out to a small body shop for rust repair and paint. 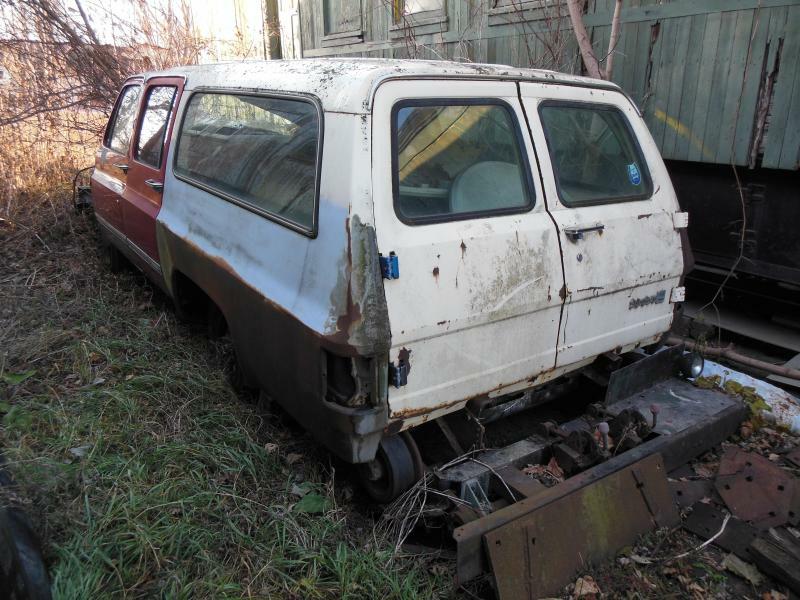 In the process, it encountered a number of unfortunate events, out of GSRM's control, including being towed and sold to a salvage yard without GSRM's knowledge! GSRM managed to find it and actually had to buy it back. In the course of its adventure, it lost the front clip, fenders, engine and transmission as well as the seats. At least it still had all the Hy-Rail equipment. Unfotunately we're left with a shell and an expensive restoration as well as a hard learned lesson. 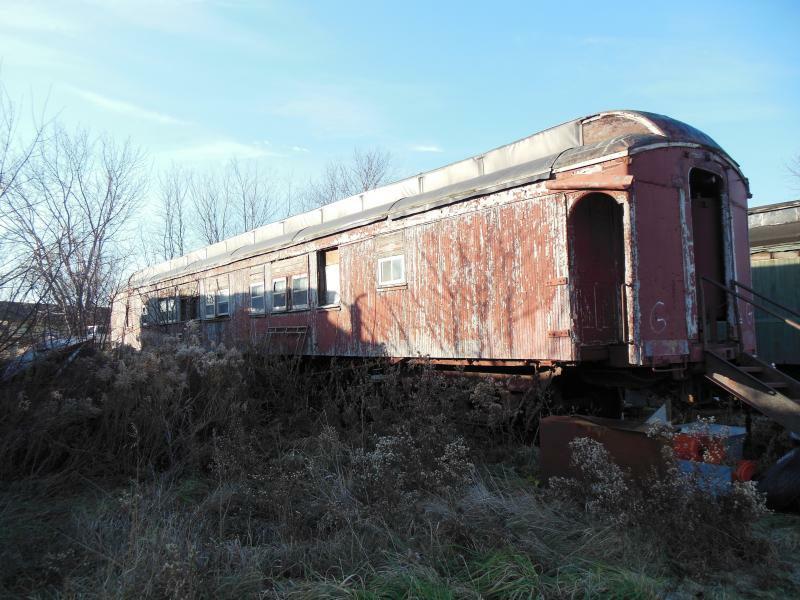 It now sits at the south end of the property awaiting funds for restoration. 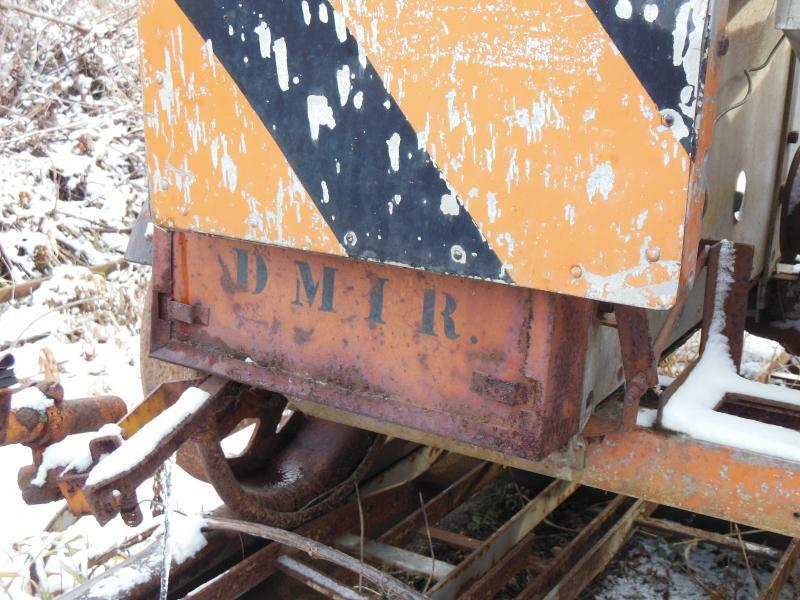 GSRM has three forlorn baggage carts like the one shown above in serious need of restoration. Here's a good example of what happens to old historic items, carelessly left out in the elements. 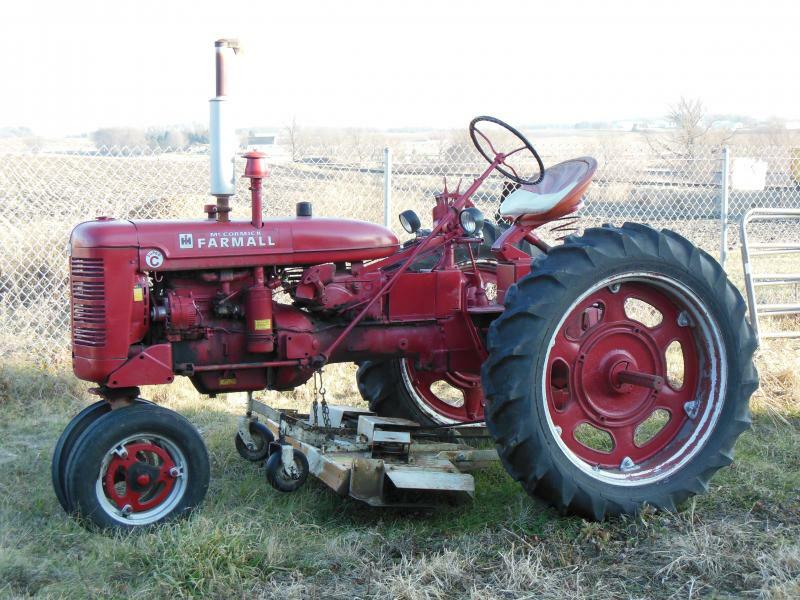 GSRM's trusty Farmall Super C, mower and all-around workhorse. 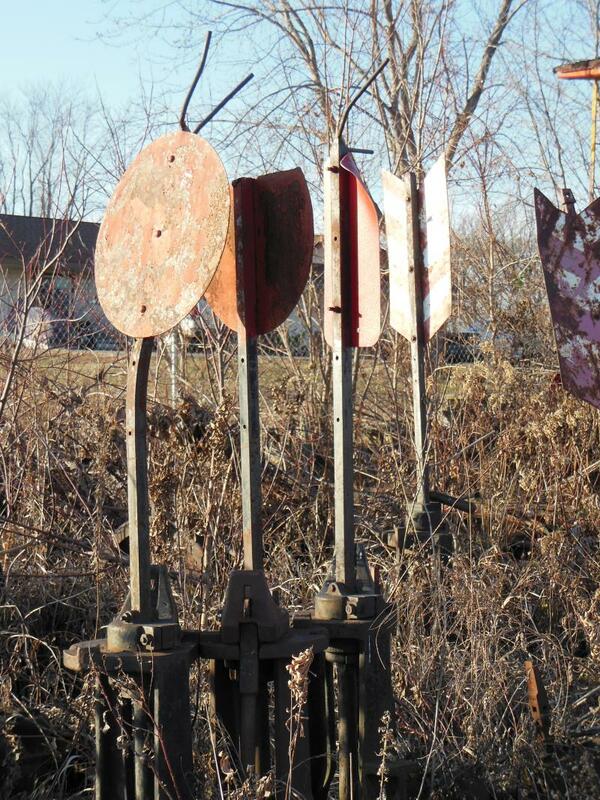 A few of the many switch stands with targets in GSRM's collection. And yes, they will be put to use as we continue to build more track and switches. The tie pile is dwindling as track construction continues. Bobcat 600, AKA "Rick James" after an unknown person scribbled grafitti on it while stored offsite in Chaska, MN.